William Penn’s “holy experiment” of religious toleration (1682) in his colony of Pennsylvania was a refuge for persecuted Catholics as well as other religions. There were Catholics in the Philadelphia area from the beginning of its colonization. The Mass was celebrated publicly as early as 1707. Old Saint Joseph’s Church, the first Catholic church in Philadelphia, was built in 1733. The Catholic population increased from forty people at that time to about eight thousand by 1790. Old Saint Mary’s Church opened in 1763 and played an important role during and after the Revolutionary War. On July 4, 1779, members of the Continental Congress attended the first public religious commemoration of the Declaration of Independence at Old Saint Mary’s. George Washington heard a Solemn Mass of Thanksgiving there on November 4, 1781 for victory over the British. On February 22, 1800, the Congress met there for a memorial service for President Washington. Holy Trinity Church was built in 1789 for Philadelphia’s German-speaking Catholics, the first national parish in America. From its inception, Holy Trinity had problems with its trustees. Following the Protestant model, American civil law allowed religious congregations to incorporate as trustees, a civil entity that owned the church property and managed church temporalities. Lay trustees in most cases managed parish property without incident, but some trustees claimed excessive parochial administrative powers and even the right to choose and dismiss pastors. The problem escalated at Holy Trinity until trustees and parishioners publicly recanted in 1802. On April 8, 1808, Michael Egan, O.F.M. (d. 1814), was appointed the bishop of the new diocese of Philadelphia, which at that time included the entire states of Pennsylvania and Delaware, and the western and southern parts of New Jersey. At this time, the diocese included about 30,000 Catholics attended by eleven priests. Old Saint Mary’s Church was selected as the cathedral. Trustee problems at Old Saint Mary’s persisted during Egan’s entire tenure as bishop. After Egan’s death in 1814, it was five years before Henry Conwell (1748-1842), Vicar General of Armagh, Ireland, was appointed the Bishop of Philadelphia. In an attempt to compromise, Bishop Conwell signed a pact with the trustees giving them the right to veto his appointment of their pastors. This pact was rejected by Pope Leo XII in 1827. Francis Patrick Kenrick (1747-1863) was eventually appointed in 1830 the coadjutor to Bishop Conwell with the right of succession. Kenrick was consecrated on June 6, 1830. The trustee problem at Old Saint Mary’s continued until Kenrick closed the church and the cemetery on April 16, 1831, after which the trustees capitulated to episcopal authority. Other significant events during the episcopacy of Bishop Kenrick were the opening of the diocesan seminary of Saint Charles Borromeo in June 1832 in his episcopal residence and the establishment of the diocesan newspaper, the Catholic Herald in January 1833. Parochial expansion also characterized his tenure; new parishes were established in the city. Among these were the Redemptorist parish of Saint Peter and Saint John the Evangelist Church, which became the cathedral in 1838. In June 1849, Kenrick opened the first Catholic hospital in Philadelphia, Saint Joseph’s, staffed by the Sisters of Saint Joseph. Educational facilities were also expanded, Villanova (Augustinian) in 1842 and Saint Joseph’s (Jesuit) in 1851. When Kenrick left office in 1851 to assume his duties as the Archbishop of Baltimore, Philadelphia had ninety-two churches, 101 priests, forty-three seminarians, two colleges and 170,000 Catholics. John Nepomucene Neumann, C.Ss.R., the fourth bishop of Philadelphia, was consecrated on March 28, 1852. A Bohemian immigrant, he was the first professed Redemptorist in America (1842). During his first ten years as a Redemptorist, he gave missions, held administrative positions for his Congregation, and was pastor of Saint Alphonsus Parish, Baltimore. During his episcopate, Bishop Neumann constantly pressed for more parochial schools. He also established Saint Mary Magdalene de Pazzi Church (1852), the first parish for Italian-speaking Catholics. He introduced in 1853 the Forty Hours Devotion to the diocese at Saint Philip Neri Church and was assiduous in visiting the parishes of the diocese. In 1857, he was sent a coadjutor, James Wood. Bishop Neumann died on January 5, 1860. In 1963, he was beatified by Pope Paul VI and canonized a saint in 1977. James Frederick Wood was born in Philadelphia and raised a Unitarian. While living in Cincinnati, Wood developed a friendship with Archbishop John B. Purcell and, at the age of twenty-three, became a Catholic. In 1857, Wood was appointed Coadjutor Bishop of Philadelphia and, at Neumann’s death, became the fifth Bishop of Philadelphia. An astute financial manager, Bishop Wood was shepherd to about 200,000 souls, 137 priests, 131 parishes and forty parish schools in 1860. He established several new parishes and, in 1865, bought a parcel of land in the Overbrook section of Philadelphia, property which was to become the new site of Saint Charles Borromeo Seminary. After Bishop Wood laid the cornerstone of the new building in 1866, the seminary opened in 1871 with 128 students. During his tenure from 1860 to 1863, the Dioceses of Harrisburg, Scranton and Wilmington were established, leaving Philadelphia with 93 churches, 157 priests, 491 Sisters and a Catholic population of 200,000. In 1875, Philadelphia became the metropolitan see for the state of Pennsylvania with Wood as archbishop. When Wood died in 1883, the see was vacant for a year until Rome appointed Saint Louis’ coadjutor, Bishop Patrick Ryan, the second archbishop of Philadelphia. With his initiative, many charitable institutions were established, as well as Cahill High School for boys in 1890 (later known as Roman Catholic High School), the first free central Catholic high school in the United States. In 1908, Ryan announced the establishment of a free central high school for girls (later known as John W. Hallahan Catholic Girls’ High School), but died before its completion in 1912. No bishop in the United States exceeded Ryan in the establishment of parochial schools. In 1884, the Archdiocese had fifty eight, by 1903, there were 103. Ryan took interest in the founding of the mother house of the Sisters of the Blessed Sacrament for Indians and Colored People in 1907, whose foundress, Mother Katharine Drexel, dedicated her life and fortune to the salvation of Black Americans and Native Americans. Philadelphia-born Katharine Drexel was beatified in 1987 and canonized a saint on October 1, 2000. With the death of Archbishop Ryan in 1911, Edmond Francis Prendergast, who had been Ryan’s auxiliary bishop, was appointed the third Archbishop of Philadelphia. Born in Ireland in 1913, Prendergast directed the building of many new charitable institutions including Misericordia Hospital, Archbishop Ryan Memorial Institute for the Deaf, Saint Edmond’s Home for Crippled Children and West Philadelphia Catholic High School for Boys and the Archbishop Ryan Memorial Library at the seminary. He died in Philadelphia in 1918. Archbishop Dennis Dougherty was the first native son to be appointed Archbishop of Philadelphia. Calling himself “God’s Bricklayer” during his thirty-three year administration from 1918 to 1951, he established 112 parishes, 145 parochial schools, 53 Catholic high schools, four Catholic colleges, twelve hospitals and eleven homes for the aged. He ordained over 2,000 priests. On March 7, 1921, Archbishop Dougherty was elevated to membership in the College of Cardinals. At the time of his death on the 61st anniversary of his ordination to the priesthood, there were 1,896 religious and diocesan priests in the Archdiocese, 451 parishes, 6,819 women religious, 305 parochial schools, thirty-one high schools and just over one million Catholics. On November 28, 1951, John F. O’Hara, C.S.C., was appointed the ninth bishop and fifth archbishop of Philadelphia. Raised in Indiana, he was ordained a Holy Cross priest in 1916. At the University of Notre Dame, he taught commerce and became the university president in 1934 and the Bishop of Buffalo in 1945. O’Hara’s episcopate here was active and vigorous, expanding educational facilities, opening new parishes and parish schools. He established the first Annual Catholic Charities Appeal in 1958. Cardinal O’Hara was also interested in the education of the mentally handicapped. He was named cardinal by Pope John XXIII in 1958. After his death on August 28, 1960, the Archdiocese was further divided when the Diocese of Allentown was established on January 28, 1961 with Auxiliary Bishop Joseph McShea as the first ordinary. The counties of Philadelphia, Bucks, Chester, Delaware and Montgomery remained with the Archdiocese as they are today. John Joseph Krol, former Auxiliary Bishop of Cleveland, was installed as archbishop on March 22, 1961. In October 1962, Pope John XXIII appointed him undersecretary of the Second Vatican Council. Archbishop Krol was also appointed president of the study committee on finances for the Pontifical Commission for Social Communications. The years of Krol’s tenure saw radical social change in the nation and the Archdiocese. Archbishop Krol implemented the teachings of the Second Vatican Council (1962 – 1965), especially the many liturgical changes. He also established a Commission on Human Relations to formulate guidelines to direct the apostolate for racial harmony and ecumenism in the Archdiocese. Archbishop Krol was named a Cardinal on May 28, 1967. In the period 1964 to 1969, the number of Catholics in the Archdiocese had increased to 1,351,704 souls. There were 1,096 diocesan priests, 676 priests of religious Congregations and 6,622 women religious. Cardinal Krol oversaw the expansion of the activities of the Pennsylvania Bishops’ Catholic Conference. He was elected the second president of the National Council of Catholic Bishops in 1971 for three years. He was instrumental in the establishment of the Shrine of Our Lady of Czestochowa in 1966. He also built the Archdiocesan Office building, opened in 1971. He retired in February 1988 and died in Philadelphia on March 3, 1996. Anthony Joseph Bevilacqua succeeded him as Archbishop of Philadelphia. He was ordained a priest on June 11, 1949 for the Diocese of Brooklyn and named an auxiliary bishop there on November 24, 1980. In 1983, Pope John Paul II appointed him the ordinary of the Diocese of Pittsburgh. Five years later, Bishop Bevilacqua was installed as Archbishop of Philadelphia on February 11, 1988. On May 29, 1991, he was elevated to the College of Cardinals. Cardinal Bevilacqua made the spiritual renewal of the faithful of the Archdiocese a priority. In addition to making pastoral visits to parishes, schools and institutions in the Archdiocese as well as other religious denominations, he aired a live radio show from 1995 to 2000. He promoted renewal of parish life by instituting the parish pastoral planning and cluster pastoral planning processes. On December 8, 2000, Cardinal Bevilacqua announced the convocation of the Tenth Synod for the Archdiocese of Philadelphia seeking to extend and foster renewal of Catholic life within the archdiocese in this third millennium of Christianity. On June 17, 1998, Cardinal Bevilacqua reached the age of 75 and, according to Canon Law, submitted his letter of resignation to Pope John Paul II. Five years later, his resignation was accepted by the Holy Father. He died on January 31, 2012. After 30 years of service to the Holy See in the Vatican’s Secretary of State, Archbishop Justin Rigali was appointed Archbishop of St. Louis in 1994. On July 15, 2003, Pope John Paul II appointed Archbishop Rigali as the twelfth Bishop and eighth Archbishop of Philadelphia. He was named a Cardinal on September 28, 2003. On October 7, 2003, he was installed as Archbishop in the Cathedral Basilica of Saints Peter and Paul. Two weeks after his installation, he was formally created a Cardinal by the Holy Father. Cardinal Rigali served as the Chairman of the United States Conference of Catholic Bishops’ Committee for Pro-Life Activities and Chairman of the Ad Hoc Committee on Aid to the Catholic Church in Central and Eastern Europe. He was a member of the Committee on the Liturgy, the Committee on the Relationship Between the Eastern and Latin Catholic Churches, the Ad Hoc Committee on the Review of Scripture Translations and was a member of the Board of Directors of the Black and Indian Mission Office. He was elected by the United States bishops in 2006 to serve as the national delegate to the Plenary Assembly of the 49th International Eucharistic Congress, and in 2005 as a delegate to the Eleventh Ordinary General Assembly of the Synod of Bishops, which celebrated the theme The Eucharist: Source and Summit of the Life and Mission of the Church. The Cardinal is a member of the Vatican Congregation for Divine Worship and the Discipline of the Sacraments, as well as the Vox Clara Committee of the same Congregation. He is also a member of the Administration of the Patrimony of the Holy See. The Cardinal is on the Board of Trustees of The Catholic University of America. At the same time he is Chair of the University Seminary Committee and member of the Administrative Committee. He is also on the Board of the Basilica of the National Shrine of the Immaculate Conception in Washington, D.C. and the Chair of the Iconography Committee. He is a member of the Order of the Knights of Malta and the Order of the Knights of the Holy Sepulchre. Cardinal Rigali is also a member of the Papal Foundation. On June 5, 2004 he became a Knight of Peter Claver. The Cardinal was also a member of the Board of Directors of the National Catholic Bioethics Center and Episcopal Advisor to Serra International. On July 19, 2011, Cardinal Rigali became Archbishop Emeritus of Philadelphia upon Pope Benedict XVI’s acceptance of his letter of resignation written the year prior when he reached the age of 75. He served as Apostolic Administrator of the Archdiocese until the installation of his successor in September of 2011. Cardinal Rigali now resides in Tennessee in the residence of the Bishop of Knoxville. Archbishop Charles J. Chaput, O.F.M. Cap. was appointed his successor by Pope Benedict XVI and was installed as the 13th bishop and 9th archbishop of Philadelphia on September 8, 2011. Archbishop Chaput was born September 26, 1944, in Concordia, Kansas. He joined the Order of Friars Minor Capuchin, St. Augustine Province, in 1965. After earning a Bachelor of Arts in Philosophy from St. Fidelis College Seminary in Herman, Pennsylvania, in 1967, Archbishop Chaput completed Studies in Psychology at Catholic University in Washington D.C., in 1969. He earned a Master of Arts in Religious Education from Capuchin College in Washington D.C., in 1970 and was ordained to the priesthood on August 29, 1970. In 1977, Archbishop Chaput became pastor of Holy Cross Parish in Thornton, Colorado, and vicar provincial for the Capuchin Province of Mid-America. He was named secretary and treasurer for the province in 1980, and he became chief executive and provincial minister three years later. Archbishop Chaput was ordained Bishop of Rapid City, South Dakota, on July 26, 1988. Pope John Paul II appointed him Archbishop of Denver on February 18, 1997, and he was installed on April 7 the same year. As a member of the Prairie Band Potawatomi Tribe, Archbishop Chaput was the second Native American to be ordained a bishop in the United States, and the first Native American archbishop. He chose as his episcopal motto: “As Christ Loved the Church” (Ephesians 5:25). Archbishop Chaput served on the U.S. Commission on International Religious Freedom, 2003-2006. Duties included religious freedom fact-finding missions to China and Turkey, and annual reports monitoring global trends in religious liberty mandated by 1998 federal law. In 2005, he was named a member of the official U.S. delegation to Cordoba, Spain, for the “Conference on Anti-Semitism and Other Forms of Intolerance,” sponsored by the Organization for Security and Cooperation in Europe (OSCE). The national Becket Fund for Religious Liberty awarded him the 2009 Canterbury Medal for his work in advancing religious freedom. Archbishop Chaput served on the Board of Directors for The Catholic University of America, Washington, D.C. (1994 – 2009) and the National Catholic Bioethics Center (1993 – 2006). He serves on the board of directors for Eternal Word Television Network, Birmingham, Alabama (1996 – present); The Catholic Foundation of Northern Colorado (1998 – 2011); St. John Vianney Theological Seminary in Northern Colorado (1999 – 2011); Redemptorists Mater Seminary in Northern Colorado (1998 – 2011); The Fellowship of Catholic University Students (2001 – present); Catholic Association of Latino Leaders (2007 – present); World Youth Alliance International (2010 – present). As Archbishop of Philadelphia, he serves as the ex-officio Chairman of the Board of Trustees of Saint Charles Borromeo Seminary. For the United States Catholic Conference of Bishops, Archbishop Chaput is currently Chair of the Subcommittee on Native American Catholics; a member of the Committee for Cultural Diversity in the Church and the Task Force for Health Care; a member of the Ad Hoc Committee for Religious Liberty; and a consultant to the Committee for Pro-Life Activities. He formerly served on the Committee for Divine Worship, the Committee for Migration, the Committee for Laity, Marriage, Family Life and Youth, the Committee on Domestic Justice and Human Development, and the Task Force on Strengthening Marriage. Archbishop Chaput served the Holy See as an Apostolic Visitor to U.S. seminaries, (2005 – 2006); the Diocese of Toowoomba, Australia, (2007); and the Legion of Christ for Canada and the United States, (2009 – 2010). In February 2014 he was appointed to the Pontifical Council for the Laity by Pope Francis. In September of 2015, he served as host for the World Meeting of Families—Philadelphia 2015, a triennial global Congress sponsored by the Vatican’s Pontifical Council for the Family. It was the largest such gathering in the history of the event witnessing over 20,000 attendees from more than 100 countries. At the end of this Congress, His Holiness, Pope Francis conducted a two-day pastoral visit to the City of Philadelphia. The capstone of this visit was a public Mass celebrated on the Benjamin Franklin Parkway and attended by over 1,000,000 people. Area: 2,165 Square Miles. 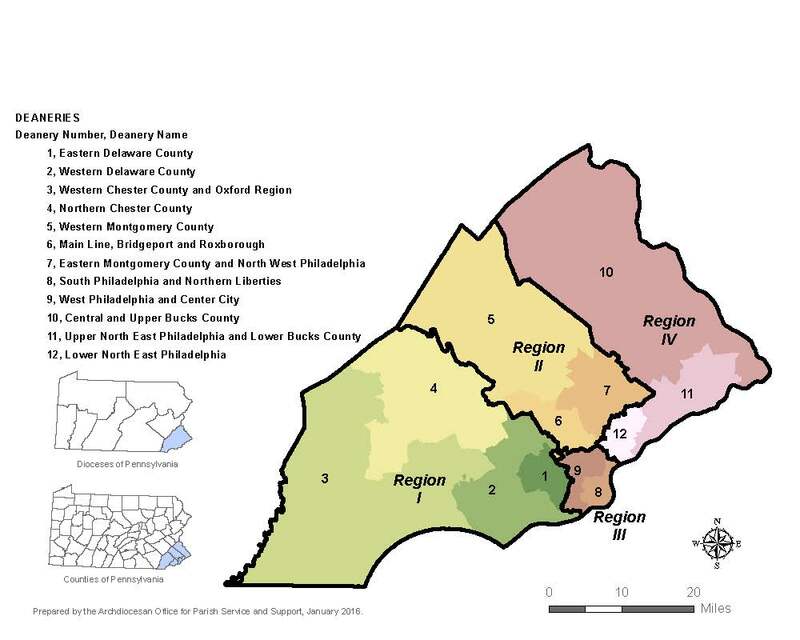 Comprising the five counties of Philadelphia, Bucks, Chester, Delaware and Montgomery in the southeastern part of the Commonwealth of Pennsylvania. When founded in 1808, the geographical area of the Diocese of Philadelphia included all of Pennsylvania, Delaware and the southern half of New Jersey. Eleven dioceses now serve this area. In Pennsylvania there are eight dioceses: the Archdiocese of Philadelphia, and the dioceses of Pittsburgh, Erie, Scranton, Harrisburg, Altoona-Johnstown, Greensburg and Allentown.